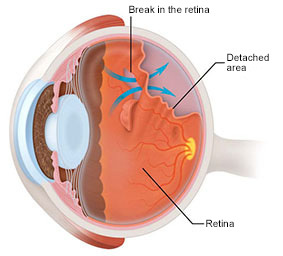 Retinal detachment is a vision problem involving separation of the retina due to sub-retinal fluid. It occurs when this layer of the eye breaks and the fluid in the vitreous space passes through the retina and accumulates underneath it. The network of nerves that make up the light-sensitive part of the retina forms a thin film that adheres firmly to the underlying tissue that sustains it. When these two layers are separated, the retina cannot function and, unless they are rejoined, it may be damaged forever. This vision problem can result from a degenerative process of the retina, trauma, inflammation or haemorrhage that tears the layer, breaking and detaching it. Retinal detachment is painless but the patient may notice floaters (myodesopsia), flashing lights (photopsia), or blurred vision. Vision loss begins in part of the visual field and extends as the detachment progresses. 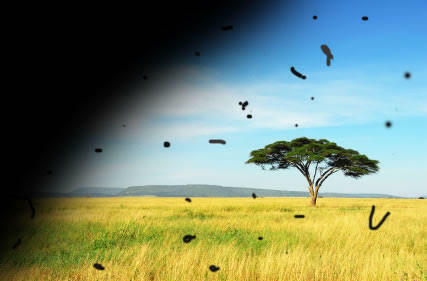 If the macular area of the retina detaches, vision deteriorates rapidly and everything becomes blurred. Retinal detachment is painless but the patient may notice moving specks called floaters. If an examination shows that retinal detachment has not yet occurred, it is possible to prevent further damage without the need for a complex surgical operation. If the patient already has a retinal detachment, surgery is required. There are three ways of attempting to treat retinal detachment.